1. Williams College math professor Colin Adams brings us Zombies and Calculus, a book that uses a fictional narrative about a zombie invasion to explain the principles of calculus. 2. UCSD neuroscientist Bradley Voytek will soon publish Do Zombies Dream of Undead Sheep? : A Neuroscientific View of the Zombie Brain, which uses zombies to help understand the functioning of (presumably functional) human brains. 3. 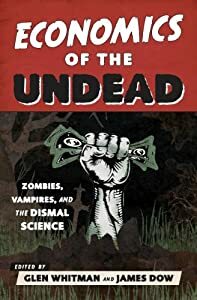 This one preceded our book by several years, but we would be remiss if we failed to mention Tufts international relations professor Dan Drezner’s Theories of International Politics and Zombies (which has just been re-released in its “Revived Edition”). Dan kindly wrote a back-cover endorsement for Economics of the Undead, which means his judgment can be trusted. This entry was posted on Wednesday, September 24th, 2014 at 12:34 pm	and posted in Uncategorized. You can follow any responses to this entry through the RSS 2.0 feed.